I Completed My First Marathon — Now What? I’m not very good at running just for the sake of it. Many people talk about a low after achieving a goal in athletics. I haven’t been feeling down, but I have found myself wondering what is next. Do I keep running long distances? Or longer runs (marathons aren’t that big of a deal in our age when so many people are doing ultra marathons in extreme climates)? Get into running with groups? Focus on speed? I’ve spent several weeks feeling unsure about the entire topic. But what I’ve realized is that I enjoy the sport a lot less when I don’t have a goal to focus on. A big part of my enjoyment in running has come from having a mark to aim for and getting closer to it each time I lace up the shoes. This is probably why I enjoy Strava so much — the stats are a big part of my running experience. I’m excited to get back to running with a specific purpose in mind. But the past month also allowed me to think about the sport overall and what I get from it. And I wanted to share with you a lot of what I’ve been reading and pondering. Related to my goals, one thing I have started to wonder about is the merit (or lack thereof) of using the Auto-Pause feature in Strava. Early in my running “career”, I discovered this feature and loved how it worked. As I’ve always been into the stats of running, I hated to increase my time while waiting for a traffic light or for the dog to do her business. I would often pull my phone out of my pocket and hit pause in those scenarios. In comparison, Auto-Pause was wonderful — it accurately stops recording once I stop running and starts again once I resume. And that worked great for my early runs of 5–15 KMs. But once I started getting into longer distances, say anything over 15 KMs, I realized this feature can be a little deceitful. As I started to train for a marathon, my runs over 21 KM (half marathon) would often include stops. Sometimes you need to do your business, sometimes you just need a breather, and I struggle to take in carbs while on the run (whether in liquid, gel, or semi-solid form). I started to wonder what other runners do with timing. Maybe more people aren’t preoccupied with their pace like I am? But eventually, I noticed that Strava itself tracks two different times for your activities: moving time and elapsed time. You can see here that my running time was 1 min 32 secs faster than the actual elapsed time. 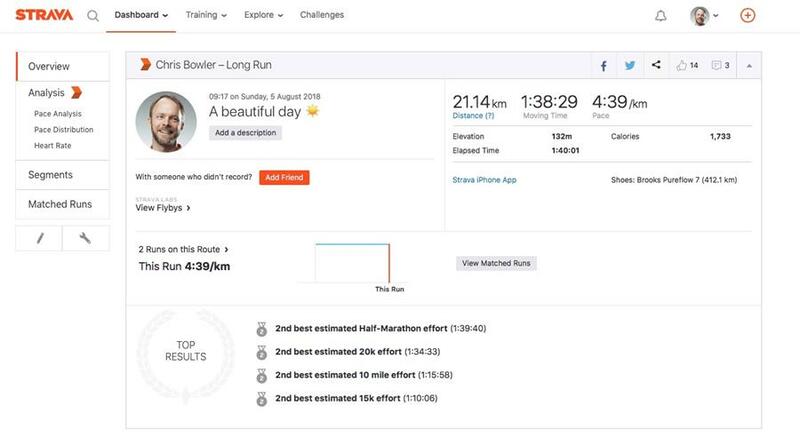 And while the activity stats use the run time, Strava uses the elapsed time to track your personal bests and any monthly challenges you’ve joined. And this makes sense. The runner who runs 10KM, takes a 15 minute break, then runs another 10 KM, should not have her stats compete with the runner who runs 20 KM straight. The result? I still use the feature on my shorter runs when I’m in town or running with the dog or a family member. But on my long runs, I began to turn it off this spring so I could have a more accurate reflection of my performance during the run. Strava has become my favorite social media tool. It’s a community where everyone is working towards something and rather than put each other down, people are lifting each other up. I find myself opening the app on occasion just to see what my fellow athletes have been up to. But running itself? While I have enjoyed the social aspects of sharing my runs and discussing training techniques, I have not yet embraced the “running group”. You have likely seen these in your own town, ten or fifteen people running together down the side of the road. I live in a town with quite a number of groups but have never made an effort to join. There are a couple of reasons for this. One is that I’m almost always focused on running quickly. Not always my top speed, but fast enough that conversation is not an option. Second, running is a solace for me. As a father of four who works all day with various communication tools on (Slack, Basecamp, email etc), I go for a run to get away from the noise and spend time in my head (as Ryan Holiday describes above). Running is a time to think through problems, to meditate, or to come up with outlines for articles or classes. And I cherish the solitude. However, I do think there is a place for running with others. Specifically for trail running. Last year, the majority of my running was on trails. I would take the dog and leave the road behind without a second thought. This year, as I focused more on distances and pace, I spent almost all my time on the road. And now when I want to hit a new trail, I’m a little hesitant to do so alone (thanks in no small part to an article I read about a fellow hiking the Appalachian trail that I can cannot seem to find, but… bears are the real deal around here). Back to my goals. As I look back on my running over the past two years, I realize that the most enjoying times were in the 10–21 KM range. I quite enjoy the half marathon and improving on my performances for those distances (5, 10, 21 KM). But when I was training for the marathon, runs over 25 KM were really just a grind. A focus on survival. While I appreciate having done it — and I may do another marathon at some point — I find more pleasure in running faster than running farther. And while I appreciate the tenacity of ultra-runners, I don’t feel any pull to join them in their efforts. So, for now, I’ll focus on improving my speeds. But also to learn to get on the road and slow down and just enjoy the pleasure of putting one foot in front of the other. Those two goals are somewhat at odds, so I also look forward to the challenge of taking both on at the same time.